Booyah Boo Spin Rig - 1/2oz Alpine Double Willow. 5.5" overall length. Weedless design gives the right amount to flash to compliment your favorite squarebills, jerkbaits, swimbaits and spinnerbaits. Equipped with a pair of silver and gold willow blades to offer an effective "bait chase" presentation. Present pressured fish with something they've never seen before. 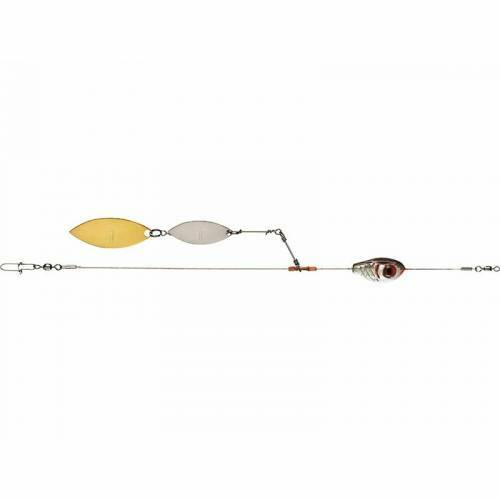 Straight weight and wire construction allows lighter, small profie lures to be fished at any depth, even down to 30-50 feet. Booyah rigs give the added weight necessary to go beyond their targeted running depth to stay longer in the strike zone. Features flexible nylon-encased wire and can accommodate all manner of crankbaits, spoons, weightless swimbaits and even jerkbaits. Assorted wire rig configurations available.